A beautiful island is surrounded by huge waves and it is located in Raja Ampat Regency. The name is Fani Island. For tourists, this name sounds unfamiliar, no? Actually, it belongs to Ayau District and becomes a good reference for holidays. Even though it is a little bit far from Sorong City, the island is worth a visit. It also has huge tourism potentials with stunning scenery. The fact is that Fani is one of the outermost islands in Raja Ampat. That means visitors should spend more efforts and time to reach the location. In terms of size, Fani Island is not quite big. It features several objects like white sand, dense trees, strong waves, and a pier. Due to the unfriendly currents, swimming in the sea is not quite recommended. 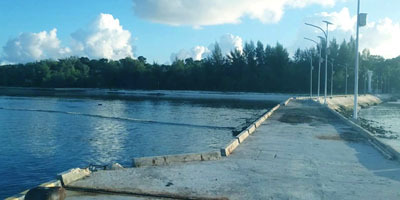 As an alternative, tourists can enjoy beach walking and sightseeing. The wooden pier is long, as well. In that location, everyone can go fishing and enjoy breezy wind! Some birds are often seen, too. They make the beach merrier and livelier! In some parts of the beach, the water is shallow, so people can play in it. Despite its secluded location, Fani Island has a small village. They are incomers, coming from Rutum and Reni society. The thing is they are not permanent villagers, as they might move to another island during a particular season. In fact, some of them argue regarding the ownership of farms and lands. For tourists, the presence of these people makes Fani Island more interesting to explore. Not to mention they have an opportunity to learn some local cultures. On top of that, the local foods are quite delicious. The next thing to do in Fani Island is beach walking. The white and soft sand is indeed quite mesmerizing, so tourists can walk on it comfortably. Not to mention the beach features a formation of coconut trees. This creates a shady nuance in the shoreline, on which tourists can relax. It is even possible to drink fresh coconut water while enjoying sea scenery. What a wonderful way to relax! When it is on the beach, it is sloppy and features stunning corals. Unfortunately, snorkeling is not recommended due to the presence of huge waves. In some parts of the beach, tourists may see confiscated boats. These were used to hunt fishes illegally by some bad people. Thus, the locals took their boats and kept these in the shoreline. Another interesting activity in Fani Island is fishing. Villagers might teach tourists how to catch fishes using snails. It is quite interesting! A trip to Fani Island involves several checkpoints. From Jakarta, travelers can take an airplane to Waisai City and the destination is Marinda Airport. Next, they need to head to Waisai Port and take a speedboat to Ayau Island. Another voyage uses the same transportation service to Fani Island. Fani is located in the north of Waigeo Island, and it takes much time to reach it. Despite this tiring trip, tourists would be rewarded by a wonderful experience.